Entry by Sabi on Tue Jun 25 16:43:22 2013. 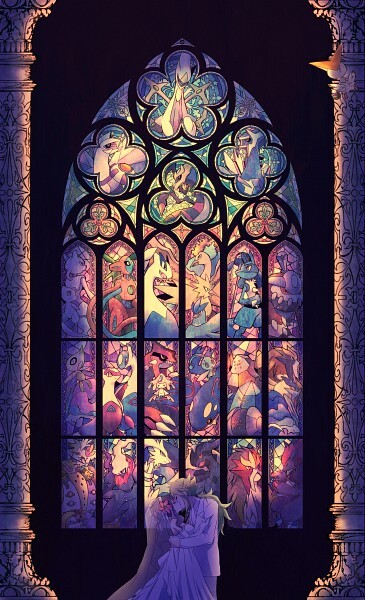 Now thats a stained glass church window!! I hope there's a church that have a windows like this!! really love this!!! Entei and suicune is on there twice. And you left out ho-oh. This is so pretty and beautiful! I'm in awe of your talent! ho-oh are not in a movie thus are not in this masterpiece. I am totally getting married there. @Kurimu Shiro Usagi it means you must build that church and get married there! N? white? are they wed already? can i object? NO? okay. vitini is the flower boy .-. Wow! it so beautiful!!! N and Touko wedding! what i really want to see is a Silver and Kotone wedding! that would be cool. Only 3 of the pokemon on the stained glass window are not legendary pokemon. Lucario, Zorua, and Zoroark. best pokemonpicture ever i love this Pairing!!! One of THE most beautiful Pokémon fan arts EVER!!! I haven't played Black & White in a while... who's the girl N's marrying? Is it one of his maids? N X Hilda wedding...! Soooo beautiful! I love FerrisWheelShipping!